I’m back with yet another fashion project, which has kept me from going insane while finishing up the final details on my tudor costume! As the title suggests, this is a dress inspired by my orchids. I got the materials for this project (and talked a bit about it) in my birthday haul. In that post I mentioned that i’m really easily inspired, especially by things around me. I’ve had a pretty little orchid sitting next to my desk since January, so it was only a matter of time until I made a dress inspired by it. I’m honestly pretty impressed with myself that I managed to hold off for three months. 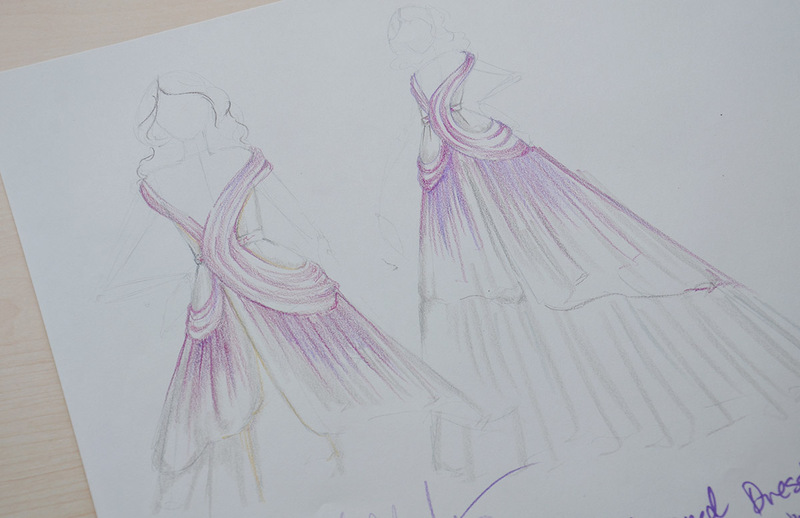 The original dress design can be seen below. 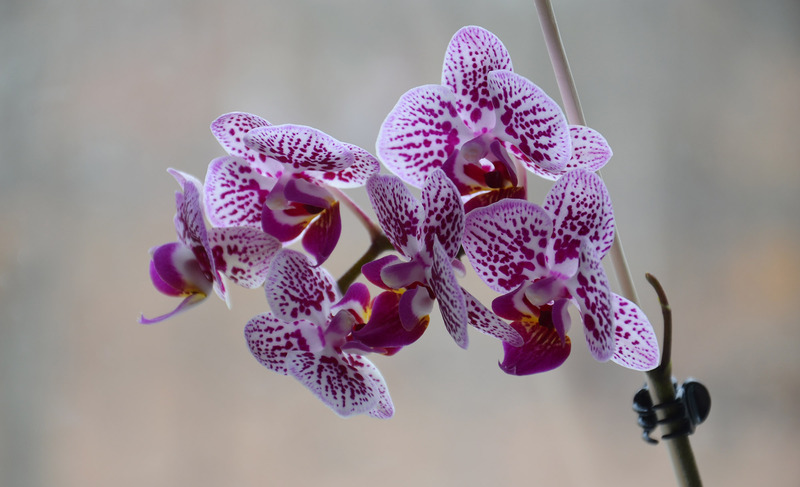 I wanted it to be simple and elegant while still being visually interesting.That is a description I would use when talking about orchids, so I think it makes sense that my orchid-inspired-dress can be described with the same words.
. I had hoped to find materials in dark ivory, light purple, and a dull fuchsia, which when used together would create a gradient effect. 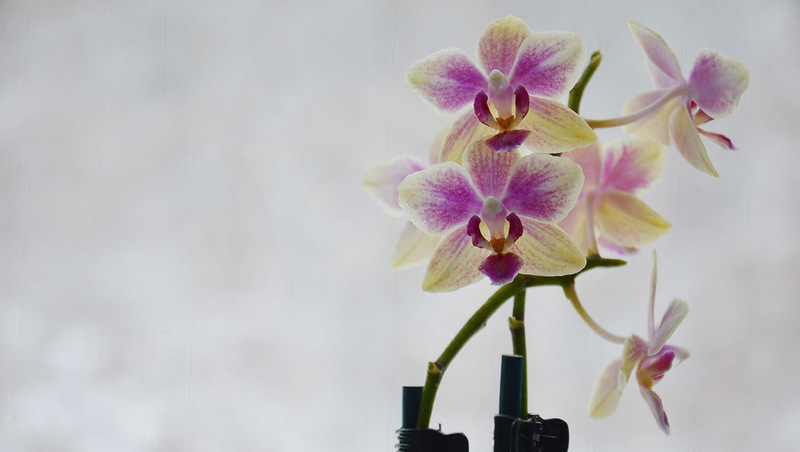 But then I got another orchid. And I found the color patterns of this one a lot more interesting. I think the deeper purple spots and contrast against the lighter ivory better fits my “Simple, elegant, and interesting” description. So the sketch got revised a bit, and my fabric choices became much different than I had originally planned! 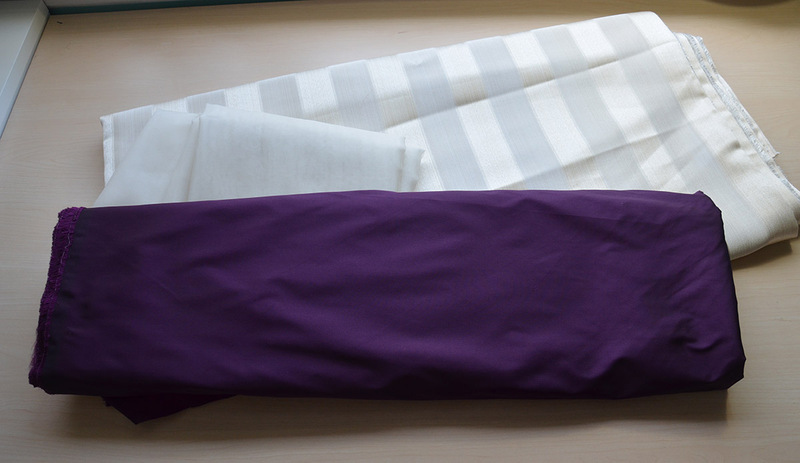 I ended up with three yards of 120″ wide striped fabric, three yards of silk organza, and three yards of silk taffeta. I thought I bought four yards of the silks, but I remeasured and realized I was wrong about that! Honestly I should have bought four yards of all these fabrics, I almost ran out part way through the project. But I standby the actual fabrics I picked, even though I got the wrong amounts. 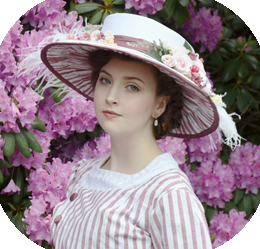 I love the color, sheen, and weight of the taffeta, it was lovely to work with. The striped material gives just enough texture to what would otherwise be a boring circle skirt, and the organza gave it a lightness that the project needed. 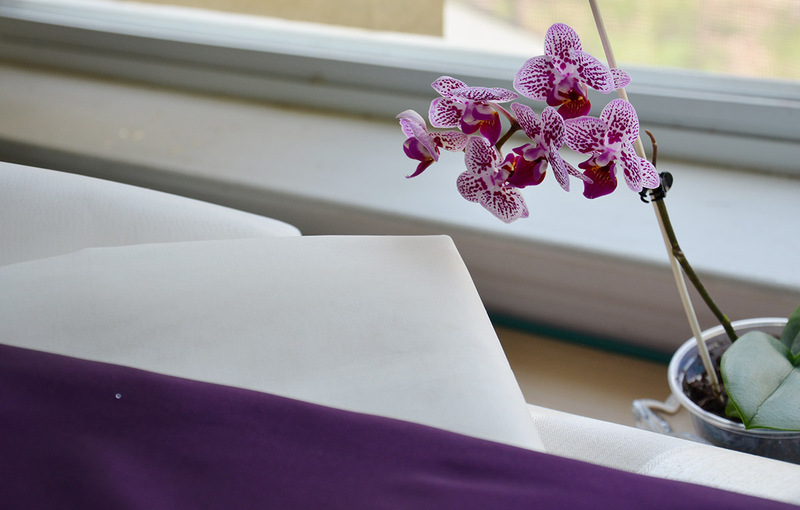 And here is Dotty (yes, I name my orchids) with the inspiration fabric. Okay! Now for actual progress photos! I wanted the bodice to be asymmetrical, and by that I mean as asymmetrical as I could get with everything still being covered. The majority of the bodice would be made from off white material, with a purple taffeta “collar” across the neckline and shoulders. I managed to accomplish the shape I wanted pretty easily, and my mock up fit on the first try! 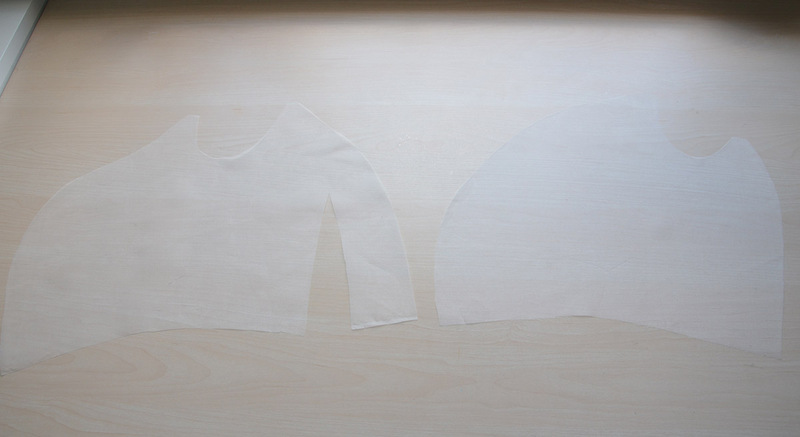 I made a few slight alterations to my pattern, the most major of which involved lowering the waistline. 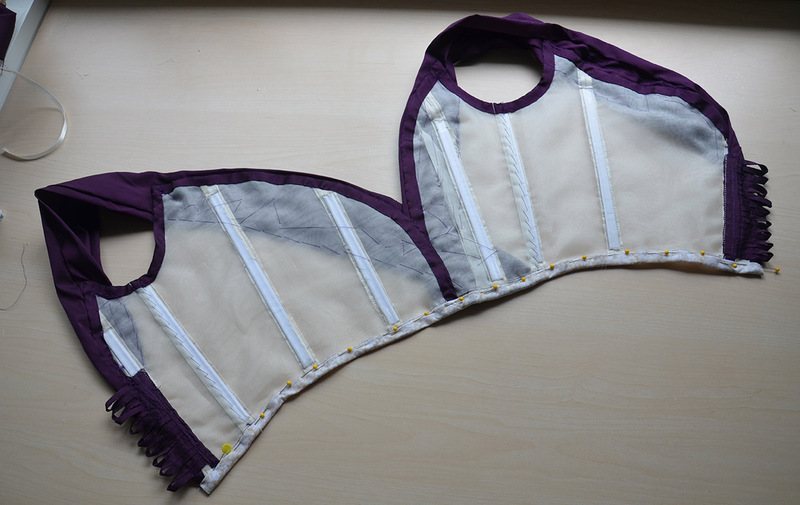 Then I marked out the boning placements and where the lacing loops would be. 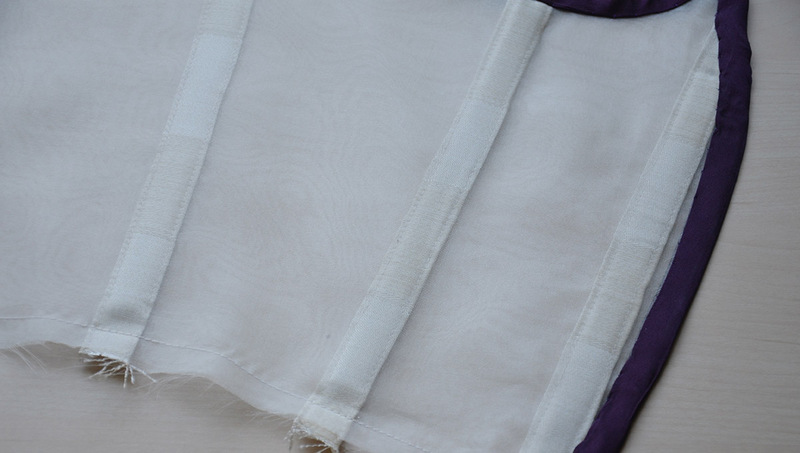 After making the skirt (which I will blog about next week) the fabric I had planned on using was almost entirely gone. I had enough to use for the bodice, but none of the stripes would have pointed in the right direction, much less matched up. 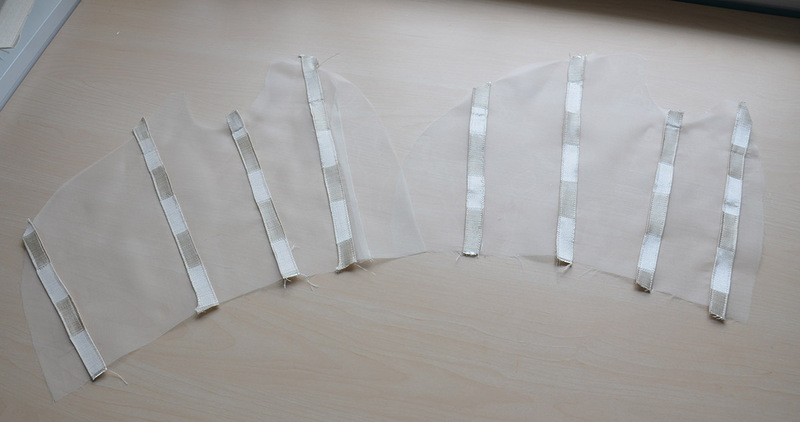 So instead I decided to make the bodice from organza, with the option to add lining later on. 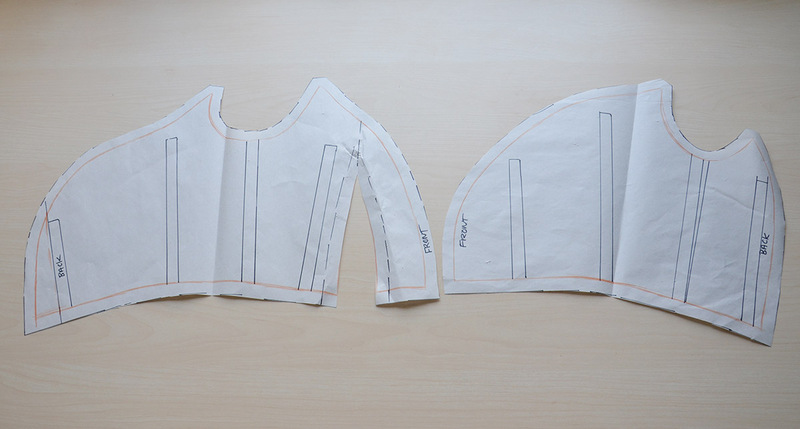 This is the bodice cut out. And with the boning channels marked out! I cut my boning channel casings from the leftover striped material. I cut these out across the fabrics grain so you can see all the stripes. It isn’t very noticeable when the bodice is worn, but I think it’s a fun touch! Those got sewn in place. Unfortunately this part didn’t go smoothly. The two bobbins I had made in advance had something (I have no clue what) wrong with them which caused a tension problem and left me with very messy loose stitches on the underside. 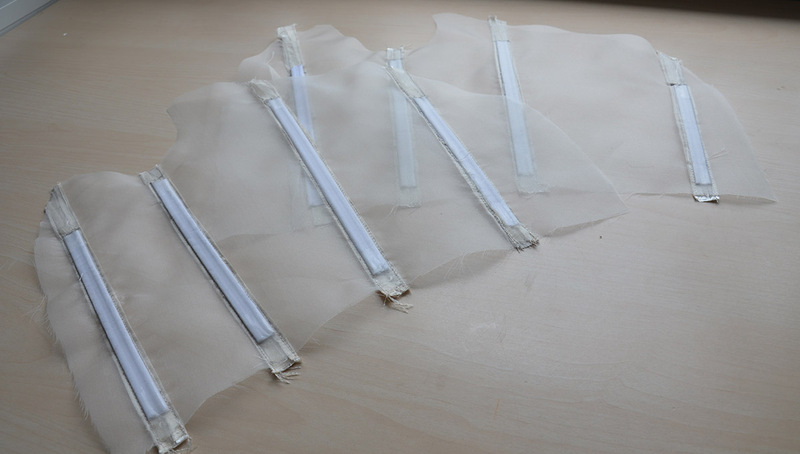 Ripping out stitches on organza is hell so I just went over the channels again after fixing the bobbin. Then I added boning! 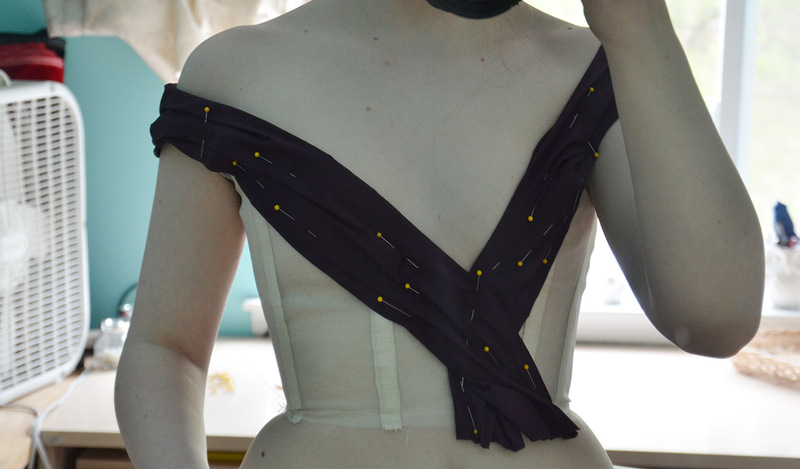 These bones don’t go to the top of the bodice, so I had to hand stitch stoppers to keep them in place. Then I added another layer of organza overtop. 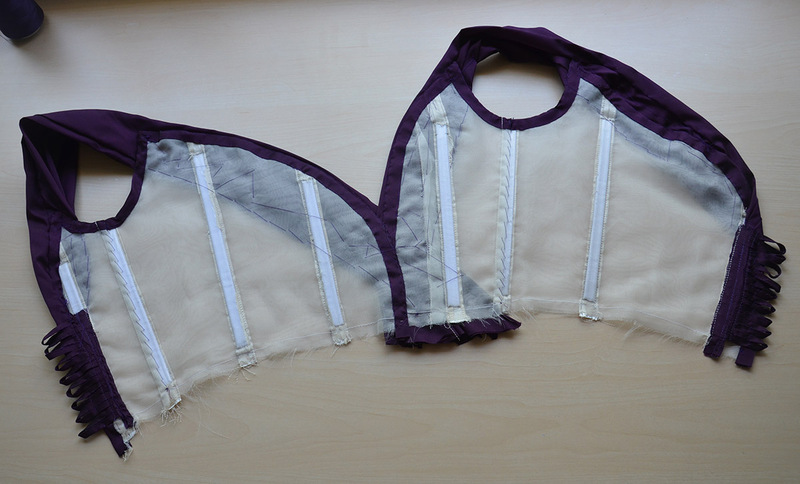 This diffuses the look of the boning channels and makes the bodice slightly more opaque. 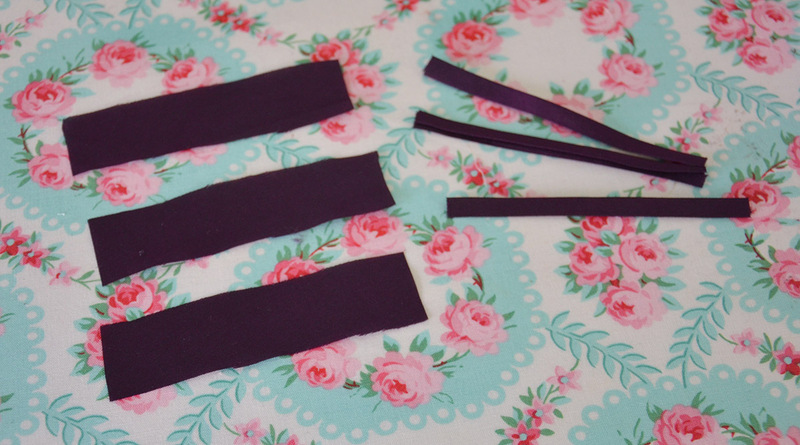 I cut two inch wide strips of purple taffeta on the bias and folded them into double fold bias tape. 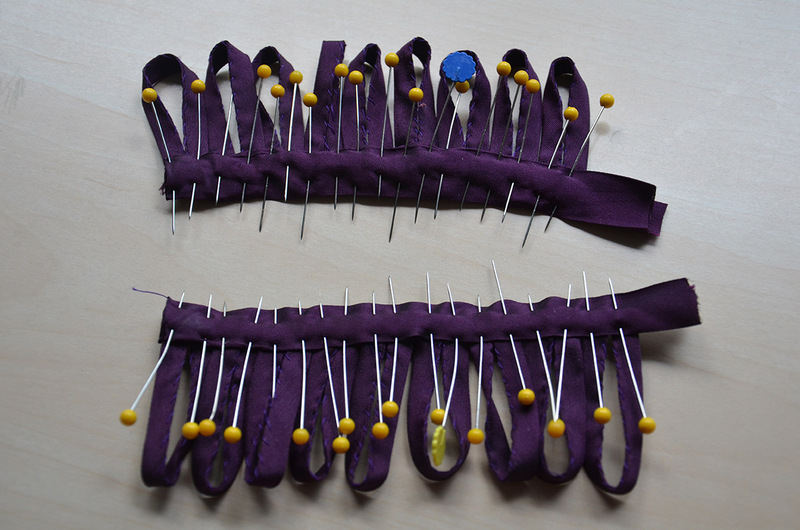 Then I pinned them around the bodices edges. I sewed it down by hand and for once i’m pretty happy with how it looks! My hand sewn bias tape hasn’t been cleanest in the past, so this is a big improvement for me. Not sure if it balances out the sloppy boning channels, but it certainly helps! 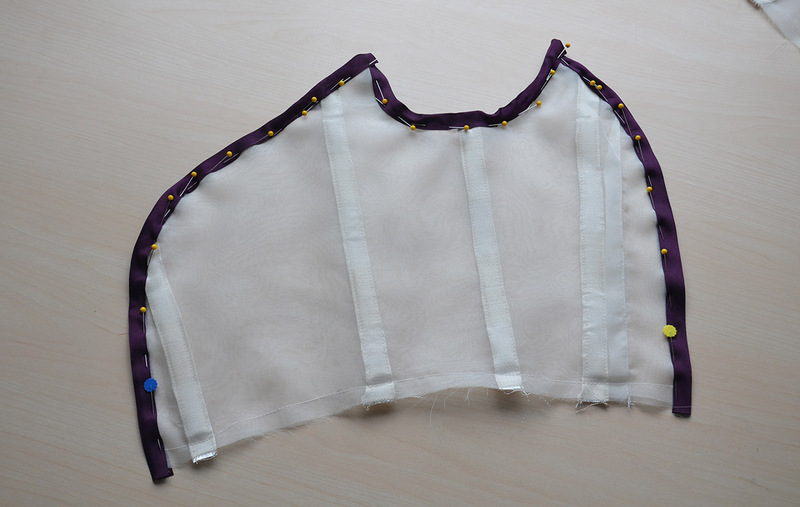 I also cut out one inch wide strips of fabric on the bias. 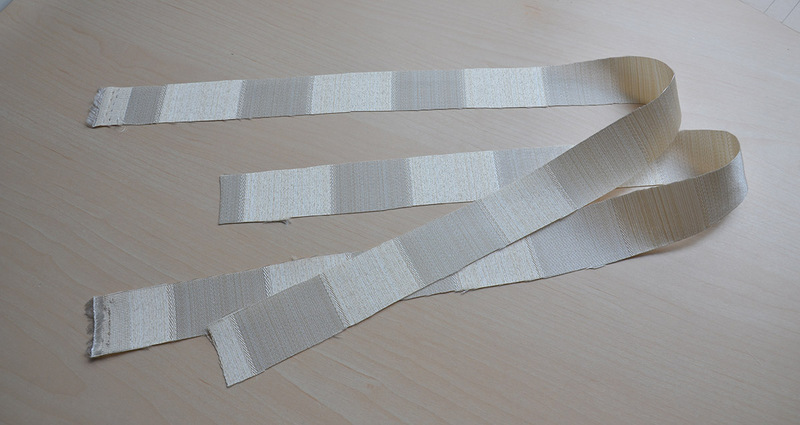 These got ironed and sewn into quarter inch wide strips that are three inches long. 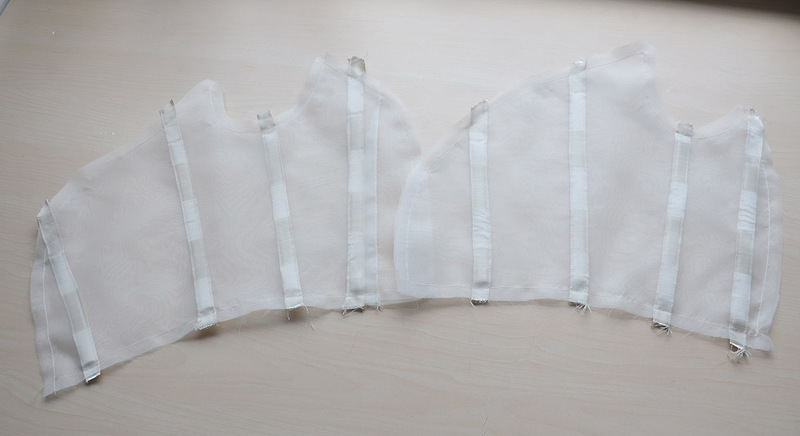 I made about twenty of them, all to be used for loops up the back of the dress. I think loops look a lot more elegant and since elegant is the buzzword for this project, I decided it was worth the extra time to make them! They got folded into loops, then pinned onto leftover bias tape. I sewed over them several times until I was confident the loops were secure. 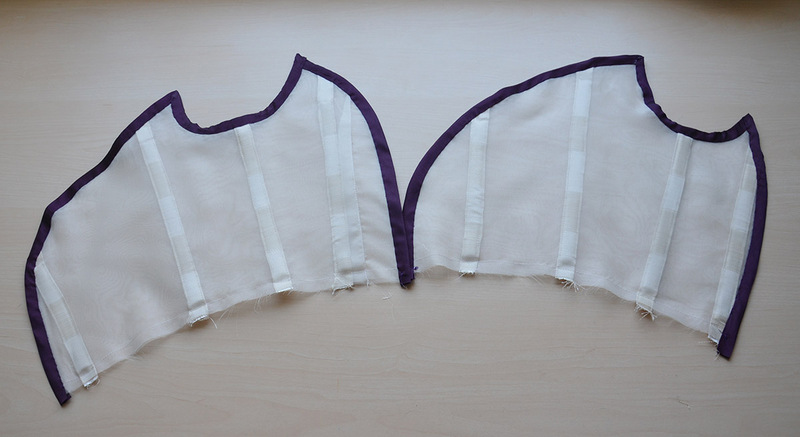 Then the loops got sewn onto the bodice. This part doesn’t look as pretty. I was trying to avoid hitting the boning channels while being unable to see where the bone ended since the loops covered them. Now it was time to add the collar. 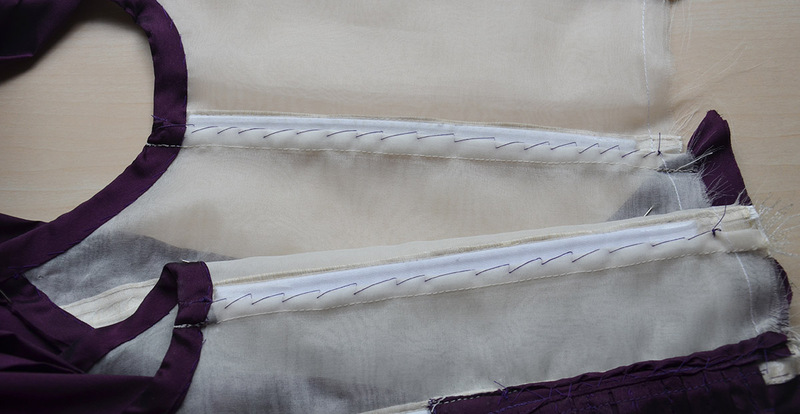 I cut more strips of taffeta and sewed them into tubes, so the raw edges were hidden inside the tubes. 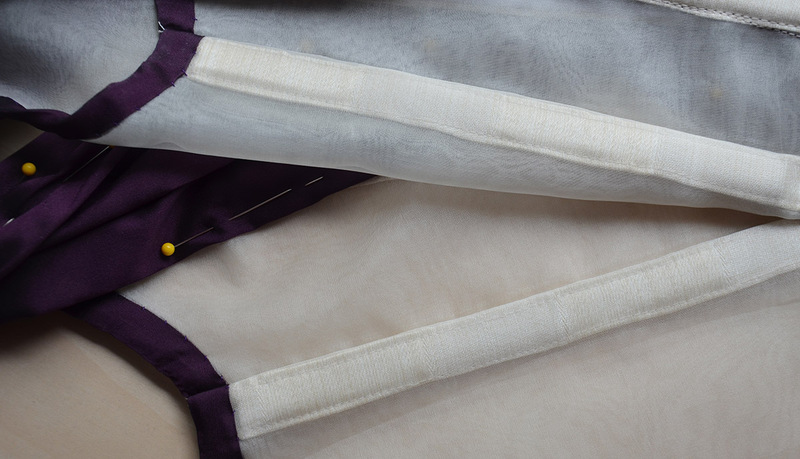 It’s a little wasteful fabric wise, but saves the time it takes to hem the strips and completely avoids having to combat puckered silk hems. I can’t really describe how I draped this. I pleated the end of the strip and placed it at the waist, then I just tugged, folded, and pinned until I was happy with how it laid. I cleaned it up a little bit after taking this picture, since the neckline wasn’t as smooth as I wanted it to be. Then I tried it on! I liked how it looked a lot, but it needed a couple of alterations. The biggest one was taking in the collar (that feels like the wrong name for this, though i’m not sure what else it would be called) at the shoulder, and taking the entire bodice in by more than an inch. I re-draped the collar so it was a little smaller in the shoulder, then tacked everything down so the pins could be removed. Before doing that I took it in by a inch. I did this in the under arm area, right next to the boning channels. 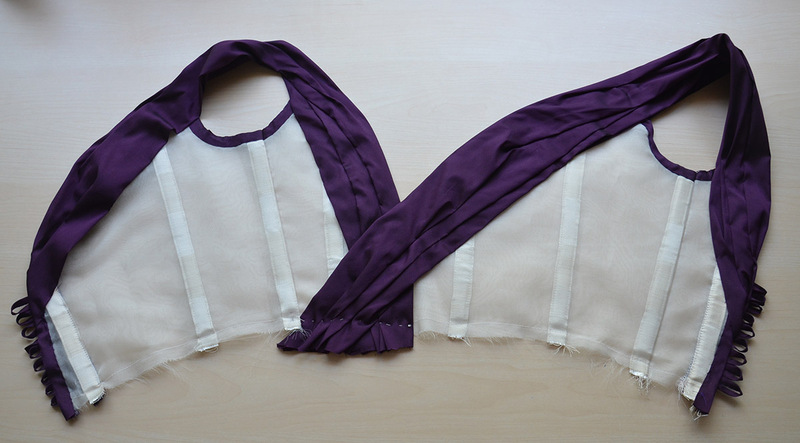 Then the extra fabric was stitched underneath the boning channels. It’s obvious from the interior, but from the outside it is hard to tell! Back to the collar. Here are all the tacking stitches. Not the prettiest thing ever, but much nicer to look at than tons of pins or puckers, which are the two alternatives. 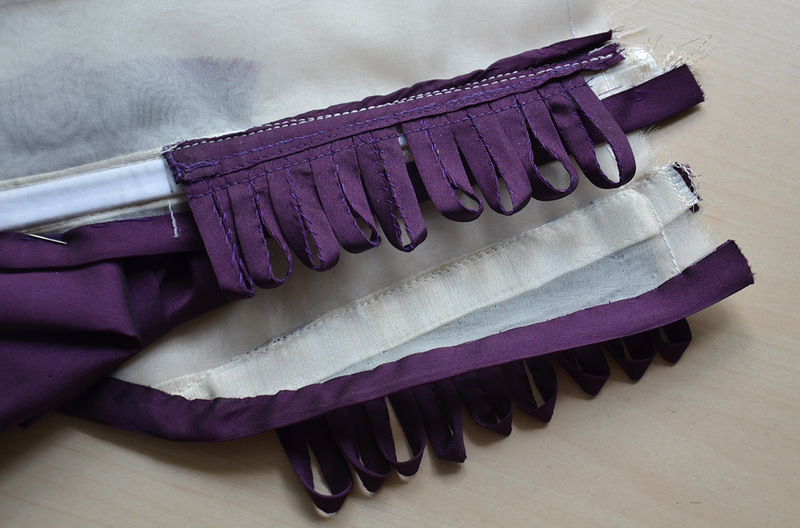 The edges of the taffeta were tucked underneath the loop closures and whip stitched down. 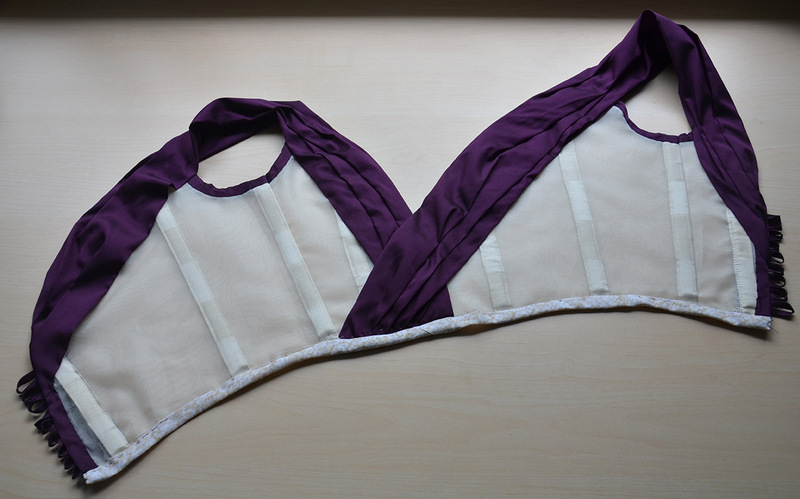 With the collar done, all I needed to do was finish the lower edge with bias tape! So I did that. This time I used cotton bias tape that I had leftover from making the skirt. And it was done! Could probably use a steaming, but that’s all that I have left to do on it. She is, indeed! My thoughts exactly. Those drawings are stunning. Can’t wait to see the finished product! Hi! I’ve recently become really inspired by your work (i absolutely love your renaissance dresses, they’re so beautiful!) 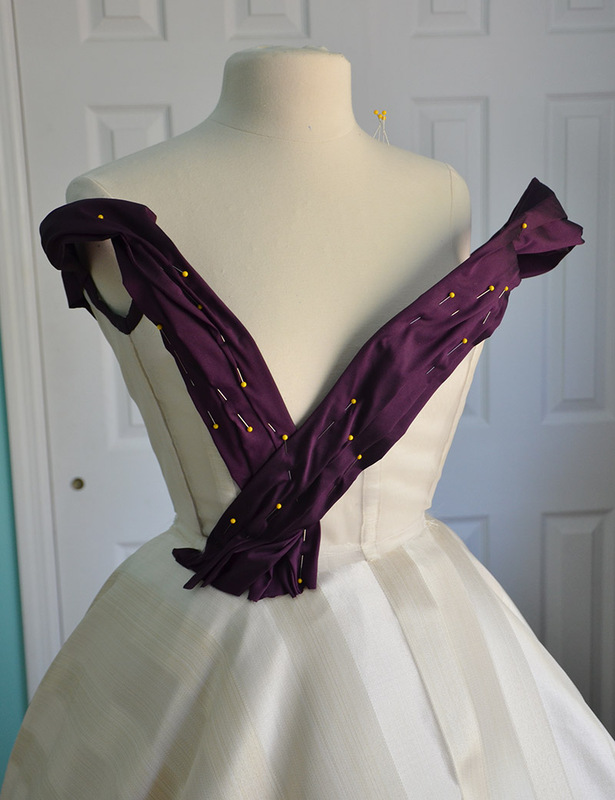 I’m 16 and i really want to start sewing dresses myself but i have no idea how to start going about it, and i was just wondering how you started teaching yourself to sew, and how you got into it. Wow, I absolutely love the neckline on this. This dress is going to be so pretty. I love your work. I check your blog nearly every day to see if you posted something 😉 This is art, girl, keep on going! The drawing looks amazing, I can’t wait to see the end product!